As the throngs of holiday season visitors leave New York City after the New Year, visitors can find a great bargain on airfares and hotels and even have an easier time getting great dinner reservations, theater tickets and more. Travelers in the know can enjoy Winter Restaurant Week discounts at many popular NYC restaurants and even take advantage of the Martin Luther King Jr. long weekend in mid-January to maximize vacation time and minimize days off of work. January is also a great time to take advantage of the great post-holiday sales at New York City stores. The key to enjoying January in New York City is packing correctly — you'll want warm clothes, waterproof footwear and plenty of layers in your suitcase to ensure you stay comfortable while exploring NYC during this chilly month. January is typically the coldest month of the year in New York City. Being in a city full of tall buildings can make the wind feel colder and stronger than normal, so be sure to pack appropriately for the weather. Waterproof boots or galoshes are essential for keeping your feet warm and dry during this very cold time in NYC. Make sure they are waterproof, not water repellant, as you will probably be stepping in some sidewalk puddles. Dress in layers — it will typically be warm in stores, subways, and attractions, but it is nearly impossible to visit New York City without spending time outside, so you'll want to ensure you're warmly dressed for walking around. Many visitors to NYC are surprised at just how much time they spend outside — unless you hire a private driver, you'll likely find yourself walking to the subway or standing on the corner hailing a cab and being exposed to whatever potentially unpleasant weather the city is experiencing. Be sure to pack a warm coat, hats, earmuffs, scarves, and gloves or mittens. Central Park Winter Jam:Winter Jam is a free winter sports festival for New Yorkers of all ages held at the end of the month. A bunch of snow from Gore Mountain is brought into Central to create a winter wonderland. There will be a live ice carving, an ice sculpture garden, places to learn to ski, a sledding hill and more. New York City Restaurant Week: Dine at some of New York City's best restaurants at a great discount during New York City Restaurant Week, held January 21 to February 8, 2019. You can make reservations here. The third weekend in January is a three-day weekend for many Americans, and Monday is a federal holiday to commemorate Martin Luther King Jr. -- this means that many businesses may be closed, but typically restaurants and other tourist attractions remain open. Daylight hours are fairly short during the winter with the sun typically rising just after 7 a.m. and setting as early as 4:45 p.m., there can be less than 10 hours of daylight. 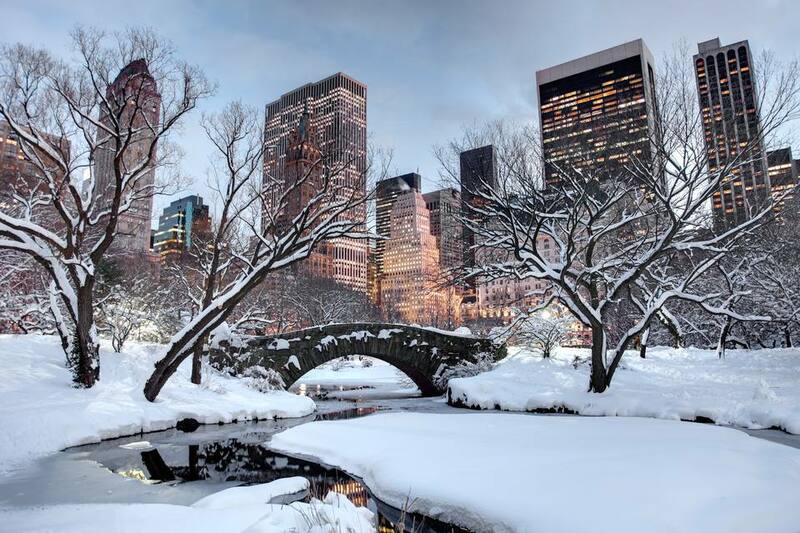 To learn more about if you want to visit New York City in the winter check out our guide on the best time to visit.